Fair trade in Scotland – Where’s it at? Where’s it going? This month we’ll be particularly celebrating the advent of Fairtrade Fortnight by featuring a short input from Martin Rhodes of the Scottish Fair Trade Forum @ 11.30am. interested in buying food and crafts in support of fair trade, justice and – in particular – Palestinian farmers and craftworkers? wanting to find unique gifts and show practical solidarity with oppressed people? keen to source ethical brands of products that you use regularly, but are not widely or often available in shops you frequent? Our wee Pop-Up Shop could be the answer to your shopping dilemmas! Since November 2018, weeWONDERBOX and Hadeel have been collaborating to regularly offer this opportunity to source unique, hard-to-get, ethical products in central Glasgow, both in occasional pop-up shop form and also through the possibility of pick-ups of pre-ordered products at the Iona Community’s Glasgow base. Today will feature the pop-up shop, with plenty of time to browse, plus a short presentation … and of course, refreshments. Bamboo Toothbrushes: Environmental and Fair Trade; in Soft/ Medium/ Child versions. On display on the day, we’ll also have a selection drawn from Hadeel’s stock (to see the full range held in Edinburgh, click on the category links below). You can pre-order food or craft items for pick-up at the Pop-Up Shop; or at another time from the Iona Community Base in Carlton Court. We hold a stock of the foods (see list above) at Carlton Court. Crafts are held at Hadeel’s shop in Edinburgh and brought through for each Pop-Up Shop. 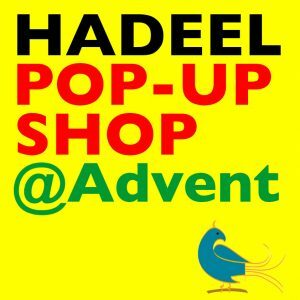 You can browse crafts by visiting the links above (or via the Hadeel homepage) and if you wish a particular item(s), in a particular size, design or colour, you can pre-order this by contacting us at [email protected] or 0141 429 7281. Thus, we can arrange for it to be brought through to Glasgow. It will then be available for pick-up at the Pop-Up Shop; or we can arrange a suitable pick-up time at the Iona Community Base on another day. Products can be paid for at the time of pick-up. 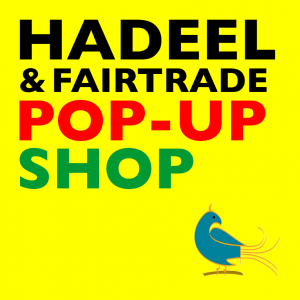 Hadeel is a Fair Trade shop which aims to provide a sustainable income and support for Palestinian artisans, farmers and others working in Fair Trade organisations and social enterprises. Palestinian handcrafts, living examples of ethnic art, and food are deeply rooted in the cultural identity and history of the people and land. They have become a symbols of the people and their striving for a normal way of life with a national status, free of the Israeli colonial occupation of their land. Palestinian handcrafts and food are part of the non-violent cultural resistance which benefits the economy and complements the BDS movement. Making beautiful handcrafts also gives people dignity and helps them psychologically to survive while living under conditions where their most basic human rights are denied. Hadeel (UK) is a company owned by the charity, Palcrafts (UK) – Scottish Charity number 033983. ‘Hadeel’ is Arabic for the cooing of a dove.